Another round of talks between the IAEA and Iran regarding its nuclear program ends without progress. No new talks scheduled. Another round of talks in Vienna between the United Nations’ nuclear watchdog agency and Iran regarding its nuclear program ended without progress on Friday, according to a senior UN official. The official said that that no further talks were scheduled between representatives of the International Atomic Energy Agency (IAEA) and Iran. The IAEA announced on Tuesday that it will renew its efforts to acquire access to the Iranian military installations in which experiments involving nuclear warheads are suspected to have taken place. 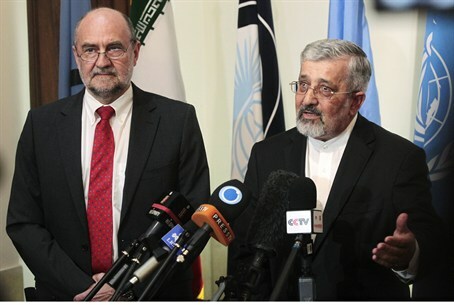 The last round between the UN’s nuclear watchdog and Iran took place in June. The two sides failed to agree on a deal allowing greater access to Tehran's contested nuclear program, including the Parchin military complex, a suspected nuclear-trigger test site, near which Iran razed two buildings several months ago. International diplomats said Thursday that Iran has accelerated its activities at the Fordo underground nuclear facility near Qom. The information revealed by the diplomats came several days before the IAEA is to publish a new report on Iran’s nuclear program. According to the diplomats, the report will say that Iran has installed new centrifuges at the Fordo uranium enrichment facility.